Sydla – You might consider a scarf joint to lengthen you 8 foot boards. Yeah, they will just be wall paneling. They will not be supporting any weight. My wife likes the clean, unbroken look of certain shiplap panels. 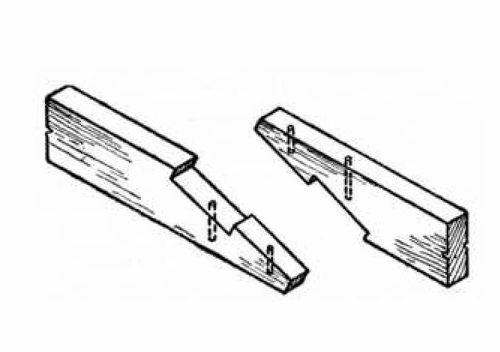 So what I would want is a method to attach these simply without the seam being noticeable as the wood expands and contracts in various seasons. That’s why I thought pocket screws and glue. I have some scraps and could play around with different methods to see what gives the cleanest look. Yeah, if you want to have it look bad and bother you for the rest of eternity. I apologize, but is this directed at me? I’d go with some sort of locking joint, like Ron posted. Wood moves around. While woods moves little the length of the grain, boards still bow and this can cause them to pull apart. A finger joint is another idea. But one where the finger run across the width of the boards. So you only see the fingers from the board edge and have just the one line across the the board. However, I’ll vote for getting the wood you need. Will the 8 ft you have match the new wood well enough? How much money are you really going to save using the 8 ft.
Of course I think it’s common for paneling boards NOT be one continuous piece. If you do use the 8 footers, be sure to randomly orient the seams from board to board. It will not be invisible. I would suggest a finger joint router bit set. If you go with the 8’ boards make sure to use enough of them to make it,look right. Use a rail & stile set to route each end of each piece. They’ll mate perfectly and won’t tend to open when flexed. The cost to buy the 12 foot boards isn’t an issue. But since I had these boards I figured if there was a way to make them work for the project. I likely will go with the longer board but might still play around with some of the suggestions above for fun. Always nice to learn a couple of new things. If you glue 2 boards end to end and leave expansion room on both sides the joint will not be affected by humidity and temp. Finger jointed boards are used for many things and dont pull apart. You could also use Biscuits or a Spline. Yes, it is directed at your post.